The key in all strategic wargames is the adaptation. 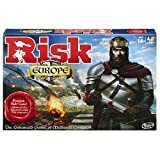 The risk map changes quickly and even every turn can be a different situation which requires other moves. The best strategy for every game doesn't exist and must always evolve. You can not win every game with the same strategy. Every game or every situation is different, and you need to think about the best counter to get back in control. Once you are in control, you can think more about working out your original game plan. 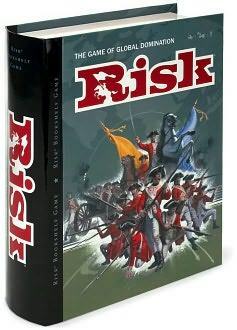 In Risk, you are playing against human opponents with minds, and they can have weaknesses which you can exploit. Unlike chess, you are not searching in Risk for a perfect move but a way to control your opponent's mind. The faster you can do this, the more successful you will be. Risk is not a team game. Alliances, if they exist at all, are always temporary. Show never mercy. If a player is down, eliminate him from the game. Luck plays too big a roll in Risk. It's always good to target a full continent that doesn't have too many fronts to defend like South America and Australia, but everyone is going for them. Europe and North America are relatively hard to start out with but not impossible. If you are in a good situation to take them early, then really go for it. However, it's never a good idea to go for Asia at the start. That's suicide. As soon as you know which territories you occupy on the map, you have to decide about your target continent. Now comes the critical decision of where to place your armies. Put all your eggs in one basket. Take in your mind to avoid a continent where other players have set a large number of troops. It's obvious to go for the continent where you have to most territories, but that's not always the best option. No matter what continent you go for, it's crucial that you can hold the continent at least a few turns. Controlling a continent makes you an attractive target for other players to attack. The sooner you can hold a continent, the better. So, make always sure that you have enough troops left to defend the continent's borders. If not, another player will for sure attack you to prevent you from getting the extra armies on your next turn. In every new turn, you must always place all of your extra armies on your borders and fronts. Remember that troops that are placed within a continent are useless. Move them to the outside because every army counts to deter invasions. Try not to let other players control continents, but don't weaken yourself too much in the process. Your opponents are planning to complete their strategic plans. If their plans go well, you will end up in deep trouble. Rather than waiting for your opponent's next move, you should take the initiative and keep them guessing. Make a surprise move to make him defensive. Make attack-and-run moves. Tease them even sometimes with a random move. Even when you are a little weaker, your unexpected moves force stronger players to think harder and be more cautious. Regardless of the turn order, Risk merely is game of math. Your best chances at battle victories within a 3-1 dice situation. Establishing your stronghold in a location where you can gain early a continent and your opponents have weak positions is vital. This strategy maximizes your chances to take over the most countries with the fewest casualties. In that same line, if you are third to act, you must be more conservative in your first-turn expectations. Most of your 1-army countries will be gone and taking over a continent on your first turn (besides Australia, if you have a chance), may not be possible. Opponents get frustrated when you keep breaking their plans with unexpected moves. Especially when players become emotional, they make mistakes. Exploit this as much as possible when it happens. Also, their egos can make them distracted from their original plans. Again surprise your opponent to disrupt his plans. Think to abandon your continent and instead invade his. This move will again disorient him, and he will be one step behind you and always have to respond to your movements. To take the initiative is many times the key to success because every time he must think about a new situation, about a counter and a new plan. 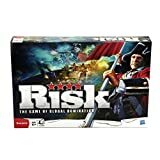 In Risk aggressive players want to dominate, and diplomacy won't help. Don't worry about such opponents because what truly matters is who actually controls the game. A very aggressive player doesn't end up having many allies or friends. Behind the scene, try to make allies with his other enemies and plan an action to undermine the aggressive player. Also, don't matter if other players think you are a weak player. Use this as an advantage to strengthen your position out of the spotlight. A main way to get ahead early in Risk, regardless of position, is to stay out of the way. The more you can avoid being attacked, the better. Saving your armies for when you are attacking and expanding is the only way to grow at a fast rate with enough protection to defend yourself. Other than preventing an opponent from getting a continent bonus on their second turn, acting third doesn't require being aggressive. Fortifying your position and branching out slower will be better in the long run. Find a location, like North America, where you can hold an area with few access points (it has three), so you can easily defend it. Players should always keep their armies grouped at the front especially when he is going to attack. Whenever possible, attack with a large group or armies rather than a medium-sized one. It's important to trace the rout of countries he intends to attack so he don't have to leave armies behind. Example: you have 30+ armies in the Middle East ready to conquer Africa. Then you first enter through East Africa. 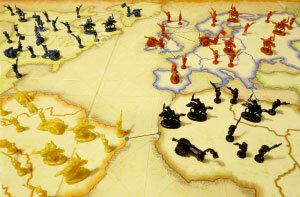 Then you best attack the territories in the following sequence: Madagascar, South Africa, Congo, North Africa, Egypt. He can leave about one-third of the armies in North Africa before attacking Egypt. 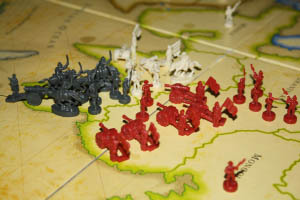 On the transfer, the player can send also one-third of the armies back to the Middle East. Like this, you will secure all three borders of Africa in order to maintain the content next round. When there is a bigger threat comming from Brazil, the player might leave a greater number of troops in North Africa or even attack Brazil. When a player holds more than half of the armies in the world, he have to watch out not to get attacked by all the other opponents. The weaker players don't have another option than to ally together because else they are lost. 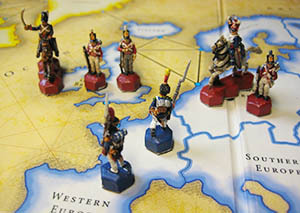 Example: one player holds North and South America and by this, he will get every turn enough extra troops to sweep his opponents one by one. He should do it like that because every time one player disappeared, he has to fight at least three armies less every turn. The strong player should have the motto: "divide and conquer" while the weaker players must think: "united we stand". Of course, the weaker players will break their ally as soon as the strong one loses his power. At any moment, you have to balance your relations with other players and use diplomacy in order to survive. Getting another player to act in your interest can be really a game changer for you. At the start of the game, everyone is ignoring Asia because it's so hard to hold it. Put all your armies on one Asia country but don't aim to go for the content itself. Every turn, you add your reinforcements to your superpowerful army and take over territories one by one each turn to gather cards. Let the other players battle for Australia or Africa and loose troops. Move your big army to your target continent and at the moment one player conquered a full continent, it's the time to attack him. At that moment, he is relative weak because he lost armies to conquer the continent. Timing is the key in this strategy. If you move to quickly to your target continent, the other players will get suspicious. Usually, after you can turn in cards, it's the best moment to launch your assault and destory your opponent in one turn.